However, over the past 10-20 years the Compact City idea has been critiqued by investigators who argue that an urban pattern with multiple centers is, in some ways, more sustainable (Jencks et al. 1996). Newton’s models (1998) found the compact pattern had low total emissions, but also the highest human exposure to fine particulates. A typology of regional-scale development patterns. Image credit: Peter Newton, “Reshaping Cities for a More Sustainable Future” (1998). The lowest exposure to air pollutants was in the corridor pattern, where growth is focused on transit corridors connected to the city center. More recent modeling has yielded similar results (Martins et al., 2007). Polycentric or transit corridor patterns may also provide better access to recreational parks and urban agricultural land, can allow more continuous greenbelts and green corridors for wildlife habitat and riparian protection, and can reduce the urban heat island effect. Cities in general — and not just “organic” cities — self-evolve into a foreground network of linked centers at all scales, from a couple of shops and a café through to whole sub-cities, set into a background network of largely residential space. Good cities, we suggest, have pervasive centrality in that centrality functions diffuse throughout the network. The pattern is far more complex than envisaged in theories of polycentrality. Pervasive centrality is spatially sustainable because it means that wherever you are you are close to a small center and not far from a much larger one. The debate between monocentric and alternate patterns is still continuing. Perhaps there will never be a universal answer, because so many outcomes depend on particular conditions and contexts. However, there is broad agreement that standard suburban sprawl is unsustainable, and that a regional development pattern of concentrated settlements and centers, combined or interwoven with natural preserves and green corridors, is the most sustainable (Newman and Kenworthy, 1999; Williams, 2004). Most ecological systems thrive in larger, contiguous preserves and corridors, and even the most minimal riparian corridors need to have a certain width and continuity to control water pollution and prevent erosion. At the same time, the assemblage of urban blocks weaves a “continuous urban fabric,” which is a necessary condition of walkable urban environments, and which encourages an active street life and public realm. The sustainable network classification should help resolve contesting human and ecological needs for contiguous, connected networks. City scale diagram: Network interrelationships are organized by settlement scale. The generalized, schematic diagram does not represent a model pattern or actual place. At the city scale, the sustainable network has multiple relationships between settlements, centers, different networks and different scales. The classification uses settlement scale to organize and present a nexus of interrelationships. The diagram includes a concise list of the key multi-scale relationships. A more detailed explanation of the list follows. ◊ Settlements are nodal, compact and concentrated. The size of a neighborhood is based on a 5-10 minute walk from edge to center, which equals a half-mile to one-mile diameter. At the largest scale, Newman (2004) suggests that the maximum sustainable city size is based on a half-hour transit ride from edge to center, a diameter of 14 miles plus or minus two miles. Beyond that size, the inconvenience and inefficiencies of travel begin to outweigh the benefits of citywide access. Settlements may be standalone, overlapping or nested. ◊ The characteristics of settlements and centers are influenced by the larger settlements and centers they are a part of. For example, a city-scale center may have the same size and population as a group of towns, but it is different than a grouping of towns. It has more and higher-quality infrastructure and transportation networks than the same number of towns in an ungrouped configuration. Similarly, a neighborhood in a city can and will have a better level of infrastructure and transportation service than a neighborhood by itself surrounded by agriculture (i.e., a rural village). ◊ Settlements have centers that may be standalone, overlapping or nested. Centers, in this context, are concentrations of nonresidential activities — public gatherings, commercial, civic, religious, educational, and others. ◊ Centers are characterized by clusters of highly accessible thoroughfares (Stonor, 2008). Porta (2007) suggests that the distribution of centers follows a power law behavior, which means that centers occupy a relatively small percentage of total settlement area. 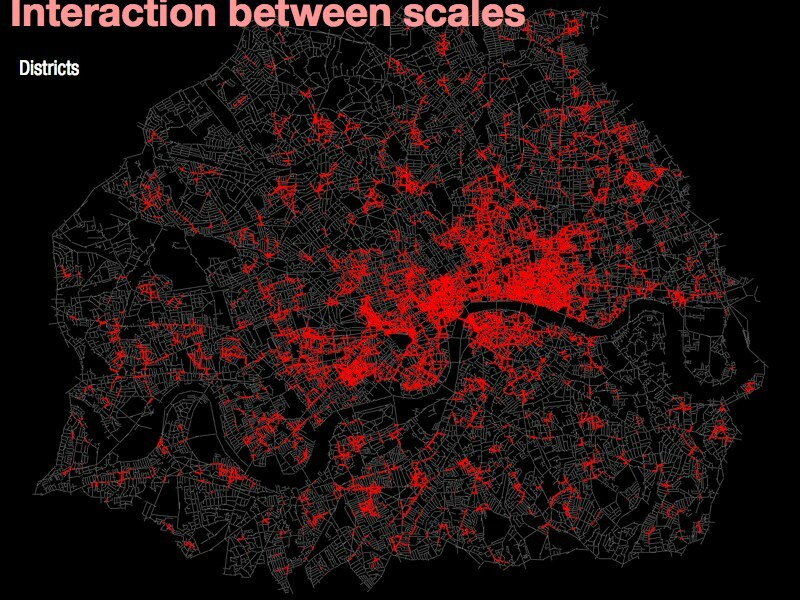 Centers marked by clusters of high accessibility thoroughfares in London, UK. Image courtesy of Noah Raford, Space Syntax Limited. Centers marked by clusters of high accessibility thoroughfares in Jeddah, Saudi Arabia. Image credit: Space Syntax Limited. ◊ The coarse-grained location of centers is related to the city-scale accessibility of routes. Centers will tend to be located somewhere near routes that are highly accessible at the city scale. The fine-grained distribution of land uses within a center is related to the local-scale accessibility of routes. This reiterates the neighborhood-scale primary relationship introduced previously. Both of these relationships have emerged from recent Space Syntax research (Hillier 1996, Greene 2003, Buendia 2007). ◊ Thoroughfare networks at all scales are contiguous, well-connected and pedestrian-oriented. ◊ The smallest scale network is the basis for all larger scale networks. For example, a city-scale route is made of segments of the neighborhood-scale network. This means that some thoroughfare segments will only serve the smallest scale, and some segments will serve multiple scales. ◊ The larger the network scale, the more continuous and direct are the routes over longer distances. Where there are interruptions to the network, it is the larger scale networks that tend to continue through via bridges, tunnels, and other crossings. ◊ The largest-scale street networks are not necessarily composed of the highest-capacity thoroughfares. They may be, but the relationship is not absolute. Some segments of neighborhood- and town-scale routes may have greater demand that requires higher capacity. Some segments of city-scale routes might have less demand, so that narrower thoroughfares might be appropriate in those cases. Just because a thoroughfare serves longer-distance traffic does not mean it will experience the most demand, so it should not automatically be the widest. ◊ Longer-distance traffic tends to use larger-scale thoroughfare networks, although local- and intermediate-distance traffic also uses large-scale thoroughfare networks. One advantage of well-connected networks at a range of scales is less channelization of traffic on large-scale networks. When there are fewer lanes and lower traffic volumes on large-scale thoroughfares, they can be more humane, pedestrian-friendly environments. ◊ Different transit types have service characteristics that are best suited to different scales: neighborhood scale served by local bus, tram, trolley, streetcar; town scale served by light rail and bus rapid transit; city scale served by metro/subway, commuter rail, and commuter bus. ◊ Bus and rail networks at each scale are aligned and coordinated with the centers and highly accessible thoroughfares of that scale. The provision of transit itself affects the characteristics of places and encourages nodal patterns of development. In concert with different types of centers (across scales and within various settlement contexts), this can produce a wide variety of transit-oriented developments. Zimmerman-Bergman (2008) reviews several transit-oriented development typologies, showing how scale can influence placemaking and transit planning. ◊ Bus and rail networks of different scales are coordinated to feed into each other. As settlement scale increases, the complexity of network layering increases. There are more intra-network transfer points and trans-network nodes. There is a greater variety of surface facilities, where transit may be mixed or separated from other traffic. There may be more 3-D layers (subsurface and elevated transit facilities) with more complex siting and coordination issues. ◊ Pedestrian and bike networks are based on the thoroughfare and green networks. ◊ Pedestrian networks can include additional facilities like paths, passages, and pedestrian-only streets. Bike networks may be routed on or parallel to the most accessible thoroughfares. Seeking the optimum balance between utility and range, bicycle networks tend to be on the intermediate scale. In sustainable networks, vehicular traffic is less channelized, and thoroughfares are safer and more pleasant for biking, so biking on the street can take place on a greater percentage of the thoroughfare network. ◊ Green networks exist on a spectrum of scales: on the local scale, small ecological sites and narrow stream buffer corridors; on the town scale, small ecological patches and wildlife migration corridors; on the city scale, large ecological patches, regional nature preserves and wilderness areas. ◊ As settlement scale increases, the area and contiguity of nature preserves associated with each scale increases. This only applies to settlements that are not standalone because standalone settlements may be associated with nature preserves of any size. For example, a village might be situated at the edge of a large regional preserve. ◊ Smaller-scale green networks do not comprise larger-scale green networks, but ideally they are connected. For instance, a collection of small ecological patches does not constitute a regional-scale preserve, although ideally they are connected to regional-scale preserves. A collection of minimally buffered streams does not constitute a fully functional wildlife migration corridor, although ideally they are connected to wildlife corridors. ◊ The wider the nature preserve, the greater the spacing between routes that cross the nature preserve. This applies to preserves within settlements and balances thoroughfare network contiguity with green network contiguity. A narrow stream buffer may have crossings every 800-1,200 feet; a wider wildlife migration corridor may have crossings every half-mile, and the widest regional preserves may have crossings two miles apart. Advantages: Organizes a number of key, interlocking network relationships with one general framework. Disadvantages: Much more complex than a single relationship; is not represented by a single, easily explained diagram. The sustainable network strives for a greater diversity of travel modes and the prioritization of the most sustainable modes. In areas where private auto and truck travel is dominant, this usually provokes protestations that congestion will be exacerbated and lengthy delays will appear, making vehicular travel excessively costly, inconvenient and inefficient. The position in favor of endless roadway expansion is that time is money, speed saves time, and more roadway capacity enables faster auto travel. Faster auto travel saves money and makes a city more prosperous. However, there are a number of flaws in this line of reasoning. 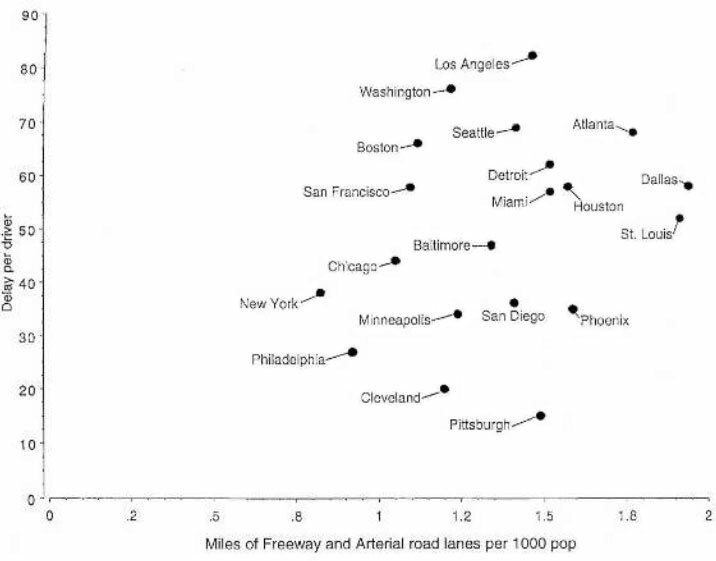 In the 20 biggest U.S. cities, there is no relationship between the amount of freeway miles and delay. Indeed, the three cities with the fewest freeway miles have less delay than the three cities with the most freeway miles. A massive study by the Rand Corporation (2008) of congestion in Los Angeles found that adding roadway capacity was fundamentally unable to reduce peak congestion. Rand recommended that roadway pricing strategies be implemented, along with policies to improve transit, carpooling, biking and walking, and smarter use of the existing thoroughfare network. A good example of what can be achieved in the U.S. is the Chicago Metropolis 2020 plan. The plan compared two scenarios over the next 20-30 years: business as usual (BAU), meaning more auto-dependent sprawl at the urban fringe, versus a nodal pattern of development focusing growth at infill locations and transit corridors. The technical report modeled the BAU and 2020 Plan scenarios, both relative to a 1996 baseline. The model showed the 2020 Plan to have far superior congestion performance compared to BAU. Goodwin (2004) explains the institutional reasons why big-ticket road building schemes that make exaggerated claims about congestion relief, time savings, etc., win out against simpler, cheaper and more effective solutions. Goodwin notes there is little firm factual evidence of the effects of transport initiatives on economic growth, and what evidence does exist tends to support pedestrian-oriented centers. Meanwhile Litman (2006) analyzed the costs of auto transportation and found that congestion costs are much smaller than crash damages and parking subsidies. The standard suburban arterial experience is long waits at traffic signals, jack-rabbit races to the next signal, followed by more long waits, repeated day after day. A better option is slower, more constant speeds. LaPlante (2008) points out that coordinated signals are easier to integrate into slow-speed networks and suggests that a 30 mph street with coordinated traffic signals can perform as well as a 45 mph street with stop and start movement. Slower speeds enable more efficient use of existing thoroughfares. Taylor (1997) modeled traffic efficiency measures including travel time and fuel usage, and found that a 37 mph speed limit with coordinated traffic signals performed best, while a 31 mph speed limit with coordinated signals performed nearly as well in most cases. Delay times were least for the 25 mph speed limit. Roads in major metropolitan areas are never built to allow free-flow travel at all times of the day, including in particular peak periods… Empty cities are not generally considered successful cities; nor should empty roads. The University of Minnesota’s Asking the Right Questions report (2007) looked into the implications of that. The study found that “even as congestion is getting worse, most people in the Twin Cities are finding it easier to get where they need to go,” which was the result of changes in development patterns and housing choices. This suggests that a single-minded focus on congestion may overlook what is important to most people — the ability to quickly and easily get where they want to go. The sustainable network classification proposed in this essay reflects a vision of ideal patterns and principles. It does not attempt to accommodate or compromise with existing practices that do not contribute to more humane and sustainable built environments. This is undeniably liberating, but also may sideline the effort as trivial and excessively idealistic. 1) Connectivity and place accessibility are prerequisite conditions for the block, neighborhood and city-scale relationships. 2) Block scale relationship: person-capacity per lane to place context. The multimodal, per-lane capacity of thoroughfares is related to walkability design elements. The latter are coordinated on a rural-to-urban spectrum of place contexts. Spatially efficient modes are prioritized, and all thoroughfares in nonindustrial, built-up contexts are pedestrian-oriented places. 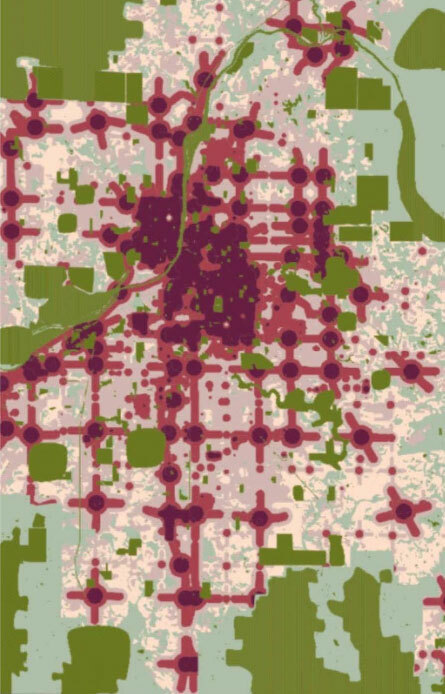 3) Neighborhood scale relationship: network accessibility to land use movement sensitivity. The accessibility of thoroughfare segments is related to the requirements of various land uses for adjacent pedestrian and multimodal traffic, in order to create viable neighborhood structure. 4) City scale concept: network interrelationships organized by settlement scale. A framework of settlement scale organizes a nexus of relationships between networks and between network scales. 5) All of the above conditions and relationships must be considered concurrently and coordinated to the maximum degree possible. This essay is only one step towards a fully elaborated and tested sustainable network classification. It can undoubtedly be improved upon. Networks overlap and interact in complex ways and it is fair to say that no one yet fully understands all the interactions and feedback loops between transportation networks and settlements across all scales. The author’s hope is that this essay will begin new dialogs and give added impetus to ongoing discussions. Questions, corrections and discussion are requested and welcome. Thanks to Noah Raford, director of Space Syntax Limited in North America, for patiently answering inquiries about Space Syntax and for providing a variety of illustrative images. Thanks to planning consultant Bruce Donnelly for his tireless investigations into settlement typologies, which have been helpful and illuminating. About Accessibility. Center for Transportation Studies, University of Minnesota. Accessed on February 19, 2009. Asking the Right Questions About Transportation and Land Use. Center for Transportation Studies, University of Minnesota, March 2007. Alberti, Marina, Ecological Signatures: The Science of Sustainable Urban Forms. Places Journal, Vol. 19, No. 3, pp 56-60, 2007. Allen, Eliot, Cool Spots: Carbon Footprint Reduction Through Community Planning. Criterion Planners, November 2008. Allen, Eliot, Designing a Cool Spot Neighborhood: An Urban Planning Technique to Reduce GHG Emissions. In Condon, et.al., Policy, Urban Form, and Tools for Measuring and Managing Greenhouse Gas Emissions, Lincoln Institute of Land Policy, in press 2009. Aurbach, Laurence, Street Connectivity Series. Ped Shed Blog, December 2006-August 2007. Baran, Perver K. et al., Space Syntax and Walking in a New Urbanist and Suburban Neighbourhoods. Journal of Urban Design, Vol. 13, No. 1, pp 5-28, 2008. CITY FREIGHT: Inter- and Intra-City Freight Distribution Networks: Best Practices Guidelines. Buck Consultants International for European Commission Fifth Framework Programme, 2005. See also the project home page. Buendia, Leonardo, Retail shop distribution in interrupted orthogonal grids: The case of Tijuana. Masters thesis, University College London, 2007. 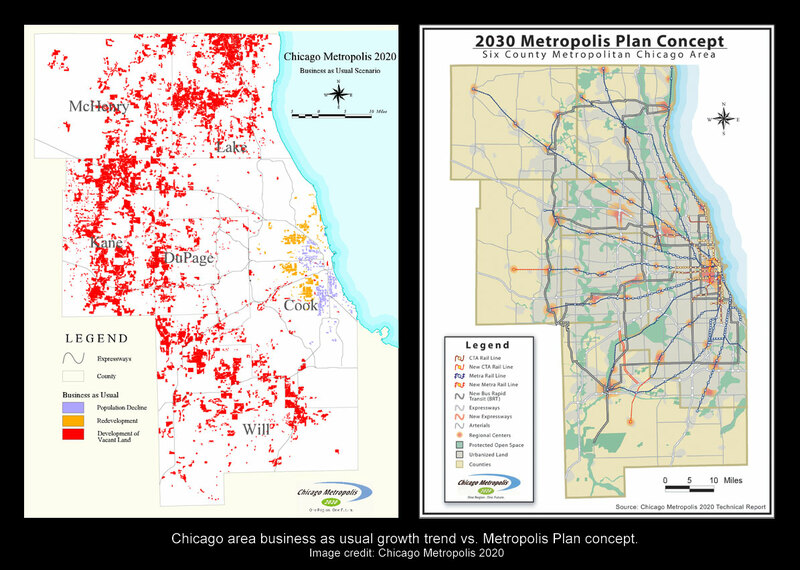 Chicago Metropolis 2020, The Metropolis Plan: Choices for the Chicago Region, Technical Report. 2003. See also Chicago Metropolis 2020 web site. Duany, Andrés, Sandy Sorlien and William Wright, SmartCode Version 9 and Manual. New Urban News Publications, 2008. See also SmartCode Central and the Center for Applied Transect Studies. European Conference of Transport Ministers, Managing Urban Traffic Congestion, Summary Document. OECD and ECTM Joint Transport Research Center, 2007. See also the project description. Ewing, Reid and Allan Lichtenstein, Induced Traffic and Induced Development: A Literature Review. Voorhees Transportation Center, Rutgers University, October, 2002. Gehl, Jan, A Changing Street Life in a Changing Society. Places Journal, Vol. 6 No. 1, October 1989. Gehl Architects, Public Spaces – Public Life Sydney 2007. Commissioned by the City of Sydney, Australia, 2007. See also the project web page. Goodwin, Phil, Valuing the Small: Counting the Benefits. Centre for Transport Studies, University College London, London, UK, 2004. Greenberg, Ellen and Fred Dock, Design Guidance for Great Streets: Addressing Context Sensitivity for Major Urban Streets. Institute of Transportation Engineers and the Congress for the New Urbanism, 2003. Greene, Margarita, Housing and Community Consolidation in Informal Settlements: A Case of Movement Economy. Proceedings, 4th International Space Syntax Symposium, London, 2003. Hall, Richard A., Walkable Streets: Re-engineering the Suburban DNA. Knight Program in Community Building at University of Miami School of Architecture, 2003. Hillier, Bill, Cities as movement economies. Urban Design International, Vol. 1, No. 1, pp. 41-60. 1996. Hillier, Bill, Metric and Topo-Geometric Properties of Urban Street Networks: Some Convergences, Divergences, and New Results. Proceedings, 6th International Space Syntax Symposium, Istanbul, Turkey, 2007. Hillier, Bill and Shinichi Iida, Network Effects and Psychological Effects: A Theory of Urban Movement. Proceedings, 5th International Space Syntax Symposium, Techne Press, pp.553-564, 2005. Hillier, Bill, Using Space Syntax to Regenerate the Historic Centre of Jeddah. International Union of Architects World Congress, Turin, Italy, 2 July 2008. Jacobs, Allan B., Elizabeth Macdonald and Yodan Rofé, The Boulevard Book: History, Evolution, Design of Multiway Boulevards. MIT Press, 2003. Jenks, Mike, Elizabeth Burton and Katie Williams (eds.) The Compact City: A Sustainable Urban Form? Spon Press, 1996. Jenks, Mike and Michael Burgess (eds.) Compact Cities: Sustainable Urban Forms for Developing Countries. Spon Press, 2000. Kulash, Walter, The Third Motor Age. Places Journal, Vol. 10, No. 2, 1996. LaPlante, John and Barbara McCann, Complete Streets: We Can Get There from Here. ITE Journal, May 2008. LaPlante, John, Retrofitting Urban Arterials Into Complete Streets. 3rd Urban Street Symposium, Seattle, WA, June 2007. Karimi, Kayvan, et al., Evidence-Based Spatial Intervention For Regeneration Of Informal Settlements: The Case Of Jeddah Central Unplanned Areas. Proceedings, 6th International Space Syntax Symposium, Istanbul, Turkey, 2007. Litman, Todd, Generated Traffic and Induced Travel: Implications for Transport Planning. Victoria Transport Policy Institute, February, 2009. Litman, Todd, Smart Transportation Investments: Reevaluating The Role Of Highway Expansion For Improving Urban Transportation. Victoria Transport Policy Institute, October 2006. See also the Transportation Demand Management Encyclopedia. Marshall, Stephen, A First Theoretical Approach to Classification of Arterial Streets. ARTISTS Project: Arterial Streets Towards Sustainability, for European Commission Fifth Framework Programme, July, 2002. Marshall, Stephen, et al., A Framework for Classification and Assessment of Arterial Streets. ARTISTS Project: Arterial Streets Towards Sustainability, for European Commission Fifth Framework Programme, July, 2004. Martins, H., A. I. Miranda and C. Borrego, “Linking Urban Structure and Air Quality,” in Proceedings of the 2007 Transportation, Land Use, Planning and Air Quality Conference. Transportation Research Board of the National Academies, Washington, DC, 2007. Marzluff, John M., et al. (eds. ), Urban Ecology: An International Perspective on the Interaction Between Humans and Nature. Springer, 2008. Newman, Peter, Keynote Address. Sydney Futures Forum, May 2004. Newman, Peter, and Jeffrey R. Kenworthy, Sustainability and Cities: Overcoming Automobile Dependence. Island Press, 1999. Newton, Peter W., ed., Reshaping Cities for a More Sustainable Future: Exploring the Link Between Urban Form, Air Quality, Energy and Greenhouse Gas Emissions. Australian Housing and Urban Research Institute, Research Monograph 6, 1998. Norton, Peter D., Fighting Traffic: The Dawn of the Motor Age in the American City. MIT Press, June 2008. Özbil, Ayse and John Peponis, Modeling Street Connectivity and Pedestrian Movement According to Standard GIS Street Network Representations. Proceedings, 6th International Space Syntax Symposium, Istanbul, Turkey, 2007. Peponis, John, et al., Measuring the Configuration of Street Networks: The Spatial Profile of 118 Urban Areas in the 12 Most Populated Metropolitan Regions in the US. Proceedings, 6th International Space Syntax Symposium, Istanbul, Turkey, 2007. Porta, Sergio, et al., Street Centrality and Densities of Retail and Services in Bologna, Italy. Environment and Planning B: Planning and Design advance online publication, 2008. RAND, Moving Los Angeles: Short-Term Transportation Policy Options for Improving Transportation. Rand Corporation, 2008. Rodier, Caroline J., A Review of the Representation of Induced Highway Travel in Current Travel and Land Use Models. Institute of Transportation Studies, University of California, Davis, 2004. San Francisco County Transportation Authority, ATG – Automobile Trips Generated: CEQA Impact Measure & Mitigation Program, Final report. October 27, 2008. Scheer, Brenda C., Who Made this Big Mess? Urban Design, No. 93, Winter 2005. Simmonds, David and Denvil Coombe, “The Transport Implications of Alternative Urban Forms,” in Williams, et al., Achieving Sustainable Urban Form. Spon Press, 2000. Steuteville, Robert, Thoroughfare design manual enters final stretch. New Urban News, January-February 2007. Stonor, Tim, The Role of Space in the Creation of Place. Placemaking: Creating a destination Conference, New London Architecture, October 2008. Svensson, Åse, ed., Arterial Streets for People. ARTISTS Project: Arterial Streets Towards Sustainability, for European Commission Fifth Framework Programme, 2004. Taylor, Michael A.P., The Effects of Lower Urban Speed Limits on Mobility, Accessibility, Energy And The Environment: Trade-Offs With Increased Safety? Transport Systems Centre, University of South Australia, Adelaide SA, August 1997. Turner, Alasdair, From Axial to Road-Centre Lines: A New Representation for Space Syntax and a New Model of Route Choice for Transport Network Analysis. Environment and Planning B, Vol. 34, pp. 539-555, 2007. UITP, Ticket to the Future: 3 Stops to Sustainable Mobility. UITP (International Association of Public Transport), Brussels, Belgium, 2004. UK Department for Transport, Manual for Streets, 2007. See also the Manual for Streets web page. Williams, Katie, Can Urban Intensification Contribute to Sustainable Cities? An International Perspective. City Matters, April 2004. Zimmerman-Bergman, Sam, Using Typologies to Simplify Complex Planning Decisions. Platform, pp. 4-9, Winter 2008.
congratulations for this interesting review of such crucial topic for urban design. Done, Sergio. Thanks for the update and for your kind words. By the way, the Human Space Lab is doing great research. I don’t know how I’ve missed this series – got to it by browsing your website after reading the wonderful piece on compact settlement and stormwater management. You’re doing excellent work. Really monumental. However, I think one of the reasons for the success (evolutionary) of the functional classification system is its simplicity. It’s easy to grasp and it’s easy to implement, at whatever scale you work. What you’re offering us is too complex as a scheme to gain widespread application. In our recently published paper, which was based on the presentation we did at last year’s CNU, we tried to formulate such simple principles: The pedestrian shed, the 400 meter rule, the importance of human main streets etc. Yodan, I certainly agree that a great strength of functional classification is its extreme simplicity. Extreme simplicity is also the fatal flaw of functional classification, because it dumbs down 5,000 years of rich urban complexity to a one-size-fits-all relationship that is utterly unresponsive to context and drastically unsustainable. If I boil down the sustainable network presented in this essay to a single idea, it is that different network relationships are operative at different scales. This essay explores what those relationships are and how they operate. This framework is undoubtedly more complex, and you are not the first to make that observation to me. But cities up until the mid-twentieth century had these patterns and relationships. The patterns may have been emergent, intuitive, or consciously designed, but regardless, they were never fully explicated. The process of walking is a good analogy. Imagine if I fully explicated the process of walking: which muscles to activate, the angle to lean forward, the timing of each action. It would be extraordinarily complex. Yet everyone learns to walk intuitively and no operational manual is needed. In the modern world we have forgotten how to “walk,” i.e., how to lay out sustainable networks and cities. Ergo the need for an operational manual. So I would ask you to consider that analogy and the irreducible need for complexity. You have focused on several particular aspects of the city scale relationship, and indeed your Figure 9 looks very similar to my city scale diagram above (although yours is better drawn and possibly communicates its ideas more clearly). The 400-meter rule and “sanctuary areas” are powerful, useful concepts. Perhaps some will prefer your approach and some will prefer mine. I think we are advocating similar goals, and any method that realizes those goals is a good thing and worth disseminating.